Christmas is almost here, which means it's time to buckle down, make that Christmas wish list, and start shopping before the most popular gifts and presents are gone. If you're tasked with shopping for kids this year, you probably want to know about the latest toys on the market, and the "coolest" items for them to bring into school the next day. According to the Good Housekeeping Institute toy experts, pet toys are going to be a big ticket item this holiday season. Especially in demand are the ones that are interactive and fun to hold, so keep your eyes peeled for the Pomsies Speckles Plush Interactive Toys series. These affordable toys clip to backpacks, clothes, and bags, so kids can bring them everywhere they go. They are usable for children ages 3 and older. Yes, you read that correctly. Unicorns are huge right now, especially with their popularity in baking and other industries that are Instagram popular. 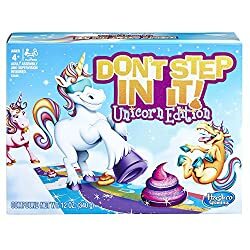 That's why one of the most popular Amazon toy games to buy right now is the Don't Step In It Game, Unicorn Edition. Simply put on a blindfold and do your best to avoid the unicorn poops. It's a game that is fun for everyone, including the whole family. Although LEGO is always popular, the Harry Potter LEGO Great Hall set is officially available this year, and is surely going to be a hit with kids 8 years of age or older. Especially if you are trying to get them into reading, or are reading the series together every evening, this a great way to make the literary world come to life right before their very eyes. This is one of those games that can be amusing to 5 year olds, as well as 40 year olds, with this fun, yet simple kind of family game that involves a silly mouthpiece. Simply put it in your mouth as it stretches your lips and cheeks past your teeth, exposing your mouth in a way that is messy, funny, and hilarious when you speak and try to answer the questions. Teammates try and guess what you are saying each turn! Watch Ya Mouth Throwdown Edition is fun for all ages. Gone are the days when simple crayons were enough to win at the holidays. Now, you can mix that colorful fun in with chemistry, providing your kid with the ability to experiment in their own personal lab thanks to this chemistry set. They might even learn some science along the way! If you're looking for a free place to host your family and friends' Christmas wish lists, look no further than giftYou this holiday season! We are happy to play host to your wish list makers as you organize your thoughts and plans for gifting the very best kids gifts on the market today.